Elissa Schaffner, a senior at Twinsburg High School, was given the opportunity to shadow a company of her choice for her Senior Experience project. 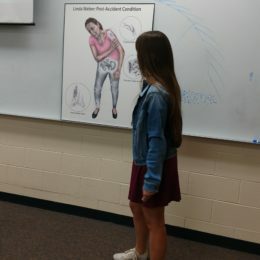 Elissa is aspiring to become a medical illustrator and chose Visual Evidence Corporation as the company she wished to shadow for three weeks. Our artists worked with her and assigned a hypothetical personal injury case to her. During her time with us, she worked on creating custom demonstrative exhibits for this case. 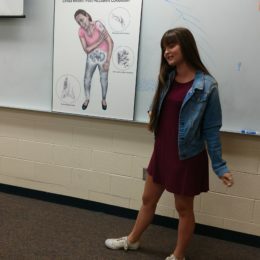 In the photos shown above, Elissa presented her work at The Twinsburg High School Senior Experience Symposium, which was held on Tuesday, May 16, 2017. We were pleased to have helped Elissa work towards her career goals and feel that supporting young aspiring artists is a great way to give back to the community!